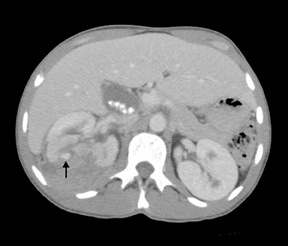 A 22-year-old African American man with sickle cell disease was involved in a car accident and presented to the emergency department with right-sided abdominal pain. The initial workup showed multiple rib fractures, a liver laceration, and kidney lacerations. Initially he was treated conservatively and was hemodynamically stable and afebrile. On hospital day number 2, he developed fever and was treated with antibiotics. He improved and was discharged on hospital day 9 with a follow-up scheduled in 2 weeks. The patient presented to the emergency department complaining of worsening abdominal pain, and 2 episodes of emesis 4 days after discharge. No other symptoms were noted. Decreasing hematocrit and hemoglobin led to a second contrast CT scan of the abdomen and pelvis. 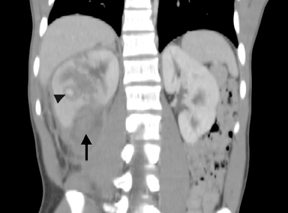 As a ligament injury was suspected to The CT scan at initial admission showed a large right perinephric hematoma with contusions and deep lacerations of the right mid-posterior kidney (Figure 1). On delayed images, no extravasations from the renal collecting system were noted. No hydronephrosis was seen. A small laceration of the liver was also noted adjacent to the right adrenal gland. Atrophy of the spleen was noted consistent with sickle cell disease. Gall stones were incidentally noted. The CT scan on return showed again the right renal laceration with interval expansion of the perinephric hematoma and pseudoaneurysm/hemorrhage in the interpolar region of the right kidney with new distortion of the right renal cortex and suggestion of active bleeding (Figure 1). A right renal arteriogram showed 2 right renal arteries (Figure 1). The more inferior accessory renal artery was initially selected and revealed no evidence of active extravasation, pseudoaneurysm, or arteriovenous (AV) fistula. Selection of the main renal artery showed multiple areas of small pseudoaneursym formation and active extravasations with AV fistula formation in the interpolar to upper polar region of the right kidney(Figure 2). A 4 French cobra 2 catheter was advanced into a sub-segmental artery in the inter-upper polar region supplying a large pseudoaneurysm and AV fistula. These were coil embolized. Then a microcatheter was placed coaxially through the cobra catheter and subsequently smaller pseudoaneurysm and AV fistulas were coil embolized. A final arteriogram in the main renal artery showed no evidence of pseudoaneurysm, active extravasations, or AV fistula (Figure 2). About 25% of the right kidney was devascularized. No other complications were noted. Often the diagnosis of renal artery pseudoaneurysm is made by CT, but magnetic resonance, Doppler sonography and renal perfusion imaging can be used as well. 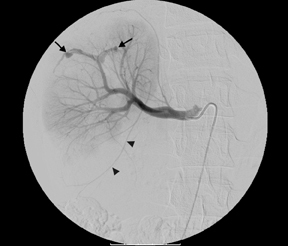 Angiography remains the gold standard to diagnose traumatic renal artery pseudoaneurysm and may reveal smaller lesions than the other techniques, as was demonstrated here.1 Moreover, with angiography concomitant therapeutic embolization can be provided. 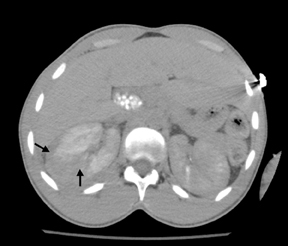 Renal artery pseudoaneurysm after blunt abdominal trauma is uncommon but can be diagnosed with standard radiographic techniques. Treatment varies between open exploration and angiographic embolization. Minimally invasive therapy by super selective trans-catheter embolization provides permanent occlusion of the pseudoaneurysms that preserves maximum renal function. Our case was successfully managed with selective embolization without any medical complications. Mizobata Y, Yokota J, Fjuimura J, et al. Successful evaluation of pseudoaneurysm formation after blunt renal injury with dual-phase contrast-enhanced helical CT. AJR Am J Roentgenol. 2001;177:136-138. Lee DG, Lee SJ. Delayed hemorrhage from a pseudoaneurysm after blunt renal trauma. Intl J Urol. 2006;12: 909-911. 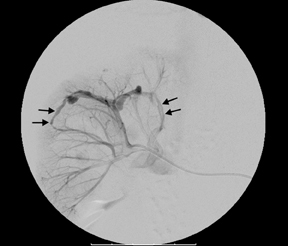 Parildar M, Oran I, Memis A. Embolization of visceral pseudoaneurysms with platinum coils and N-butyl cyanoacrylate. Abdom Imag. 2003;28: 36-40. Pseudoaneurysm in the renal arteries after blunt abdominal trauma. Appl Radiol.